The hike went pretty well. We took the road from opposite Swayambhu and walked all the way to the top. None of us had been there before, and neither had we any maps. All we did was follow the road and asked the locals in between. It took us about one and half hour to reach the top. For beginners, this is a perfect a hike. Not far away from the city and the shops and yet far from the hustle and bustle of the city life. There is bit of a steep climbs that lasts for about 5 minutes, but overall, it isn’t that tiring. From the beginning we knew that the Gumba would be open only on Saturday; however we had been expecting to be allowed inside the compound at least, but we weren’t. Nevertheless, the view of Kathmandu valley, the cool breeze, the salla forest below, the sound of the khola, and having reached the top itself is worth the walk. The amazing part about the walk is that the Gumba looks relatively near, maybe it is, but when you walk you have to go round and round before finally reaching it. 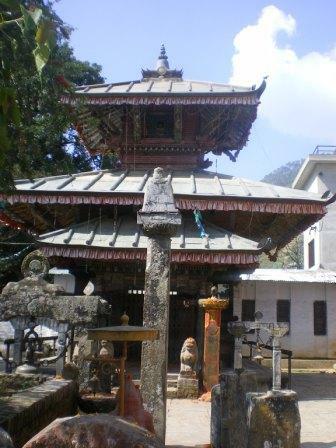 Not just that on your way you can also visit Ichhangu Narayan (picture below), one of the four Naryan Dhams. We decided to take a different way back and all we had to do was just follow the road. The road was a short cut one. Though we took almost 2 hours to reach the top, we were down in about an hour – and though it had to do with coming down being a bit easier than climbing, the way was a short cut too. Overall, I liked today’s hike – had my blood pumping, muscles exercising and me wanting for more hikes, next time a bit further. This entry was posted in Reflections and tagged Hike, Ichhangu Narayan, Seto Gumba.